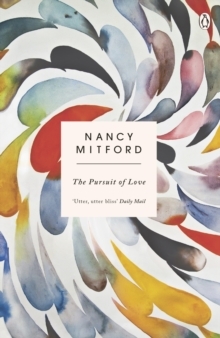 I have a terrible weakness for books about absurd posh people being eccentric in large houses between the wars, and I'm also fascinated by the Mitford sisters*, so it's remarkable that I'd never got round to reading The Pursuit of Love before and I doubt anyone will be surprised that I loved it. The Pursuit of Love clearly borrows fairly heavily from Nancy Mitford's own bizarre upbringing. It's narrated by Fanny Logan. Fanny's mother, known as 'The Bolter' has abandoned her in order to pursue a series of love affairs, leaving her in the care of Fanny's Aunt Emily. Emily and Fanny spend a great deal of time staying with their relatives, the Radlett family, at their ancestral home of Alconleigh. Needless to say, the Radletts all seem to be, in varying degrees, slightly mad. Uncle Matthew is a blustering tyrant who despises foreigners, the nouveau riche, Catholics and people who say 'notepaper', 'mirror' and 'perfume' instead of 'writing paper', 'looking glass' and 'scent'; one of his favourite activities is hunting his own children with bloodhounds. While Aunt Emily insists on sending Fanny to school, Uncle Matthew refuses to allow his daughters any kind of education. What's slightly odd about The Pursuit of Love is that it seems to begin very much as Fanny's story, but then it becomes clear that the focus of the narrative will be the Linda, the second-oldest Radlett sister. We see Linda fall in love with a wealthy banker her father hates and whose own family are horrified by her aristocratic naivety about money and her complete inability to understand why her husband needs any sort of career. After Linda almost dies giving birth to a baby she actively despises and wants nothing to do with, it becomes clear that her marriage can't possibly last - and from that point on we watch Linda embark on a series of relationships with desperately unsuitable men on both sides of the English Channel, as the Second World War looms. The benefit of having the story narrated by Fanny rather than Linda herself is that Fanny, despite her closeness to the Radletts, is just enough of an outsider to be able to see them from a more objective viewpoint - plus, the parallels between Linda and Fanny's own mother give Fanny's perspective an extra dimension. It's also important that Fanny has, unlike her cousins, been educated and seen at least a little of life outside Alconleigh. It's Linda's complete lack of any occupation or friends beyond the Radlett circle that lead to her meeting and falling for her first husband in the first place, although Linda herself is apparently unable to see this. The pursuit of love is all that Linda has to look forward to, and it's really no wonder that she approaches each of her relationships with such childlike idealism. The Pursuit of Love is without a doubt very funny, and often the fun poked at the Radletts is affectionate - but there is sometimes a more satirical undertone to the humour. There's a strong suggestion that this kind of aristocracy between the wars is a dying breed, and that they might just be responsible for their own downfall. The writing is razor-sharp and the dialogue is perfection; this is a book full of wit and sparkle. And yet despite that, there's a genuine sense of tragedy to it too and a very real sadness - the closing line, which comes from Fanny's own absent mother, is incredibly bittersweet. *If you're not sure which Mitford sister is which, you really just need to know that Nancy wasn't one of the fascist ones.